The Kimberley Region is the remote and beautiful northerly portion of Western Australia. It covers an area of 423,517 sq km or twice the size of Victoria, three times the size of England, and comparable to California. 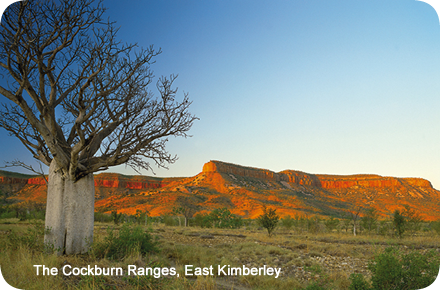 The Kimberley Region has a diverse ever-changing landscape. From wide-open vistas of the Derby Region in the west, the impressive ancient reef system of the Napier Range, awesome sandstone ranges and plateaus of the central Kimberley with spectacular gorges and waterfalls, the immense Lake Argyle in the east, to the green irrigated valley of the Kununurra Region nestled amongst red sandstone hills. Immense skies, mighty rivers, spectacular sunsets, abundant wildlife – this is God’s Country! Beyond the boab trees of Derby, the pioneer town of the Kimberley, you’ll discover adventures on land and sea. The country around Derby is rich with them, but there are other riches to discover beyond the boabs, where the giant northern tides rush in to meet outback adventure. Explore the Gibb River Road, the awesome Horizontal Waterfall and the Buccaneer Archipelago or explore the rich history of the “oldest” town in the Kimberley. Kununurra in Western Australia (WA), makes the ideal base for anyone wishing to get around the East Kimberley region. With so many places to go and so much to see, the hardest part will be deciding whether to stay for one week or two in the East Kimberley. See natural wonders and rugged ridges and be awed by the magnificent Lake Argyle. From sparkling diamonds to barramundi fishing, Kununurra has it all.